The Europeanisation of Contested Statehood: The EU in Northern Cyprus is a timely contribution to existing literature on Cyprus, European Studies and Europeanisation. Nikos Christofis argues that George Kyris provides a formative study of the impact and influence of the EU on northern Cyprus for researchers, specialists and non-specialists alike, and a valuable insight into the ‘Cyprus Problem’ that crucially places northern Cyprus and Turkish Cypriots at the heart of the analysis. The Europeanisation of Contested Statehood: The EU in Northern Cyprus. George Kyris. Ashgate. 2015. It’s been quite some time since there has been such a state of euphoria on the island of Cyprus. Groundbreaking statements are being made about the mistakes that have been made on both sides by Cypriot leaders in the past, and discussions about the urgent need for a viable and lasting solution have taken the lead. Fundamental to that euphoria was the victory of Mustafa Akıncı in the elections held in northern Cyprus. In that respect, The Europeanisation of Contested Statehood: The EU in Northern Cyprus is both timely and fills in an important gap in the literature on Cyprus, European Union Studies and Europeanisation. The fact that northern Cyprus and Turkish Cypriots are at the epicentre of the analysis – an exception to the rule since most studies neglect or pay limited attention to Turkish Cypriots – makes the present study an invaluable contribution to the Cyprus Problem. While Turkish Cypriots are technically part of European Union (EU) territory, the northern part of the island has not seen the implementation of acquis communautaire, and the full integration of Turkish Cypriots into the European family is still pending. Taking up these issues, this study explores the role of the EU in this process as well as its policies and how the EU is internationally engaged with contested states, in other words, ‘self-declared independent states, which are not recognized as such by a considerable part or the whole of the international community’ (1). Northern Cyprus here is the case in point. The book is not only informative, but also so well-structured that the author effectively guides the reader through his narration and argumentation, a rarity in such studies. The book is thus extremely useful for both specialists and students who are getting started in their studies of the Cyprus Problem. Although the book’s main focus is on Europeanisation and European and Cyprus Studies, there is a wide range of topics that are touched upon, including politics, the economy and conflict resolution. The author starts off by providing a detailed overview of the existing literature on Europeanisation, whilst concurrently situating his research questions in a clear framework, relating them to the impact of the EU on the contested state of northern Cyprus. At the same time, in order to explain EU-induced changes, Kyris focuses on three distinct domestic remits: institutions, political parties and civil society (5), each of which is treated separately in the remaining chapters of the book. Through an exploration of the issues that the case of northern Cyprus and Turkish Cypriots raise for EU regulations, Chapter Two traces the history of the Turkish Cypriots and Cyprus in general from Ottoman times to the present, which led to the current quagmire of contested statehood. As Kyris notes, this chapter seeks to place Turkish Cypriots in a historical context and highlight the characteristics of their contested state, and the author manages this with great dexterity. The following three chapters deal with Turkish Cypriot civil society, political parties and institutions in light of the EU. In all three chapters, Kyris makes a valid point by regularly addressing the pre- and post-accession periods. This helps the author carefully structure his narrative and tease out the differences and factors that have influenced each aspect of the fields mentioned above. As the book makes clear, there is a distinct but interwoven connection between the two phases, as, for example, in the case of civil society and political parties. On the one hand, the differences caused by the point of the rupture of accession are apparent in all aspects of Turkish Cypriot economic, political and social life. For example, before accession the anticipated benefits of EU integration were a key reason that the Turkish Cypriot public supported reunification (67), while, as the author analyses in Chapter Five, the same happened with political parties. Turkish Cypriot civil society and pro-European moderate political parties seem to have responded in accordance as they both saw in the European prospect a long and viable solution to their problems and to the Cyprus Problem. On the other hand, the Turkish Cypriot hard-line parties have been profoundly affected by, and to a large extent have represented, ‘patron state’ Turkish nationalism, and as such they have been in favour of a compromised solution to the Cyprus Problem, thus marking a distinct difference amongst Turkish Cypriot political parties (80-91). After accession, however, Europeanisation was seen more in relation to the financial and technical support of the EU as a strategy that could underpin a new skilled civil society distinct from the unprofessional one that existed before (68). Kyris makes relevant and interesting points by exploring the importance of the regional dispute for domestic affairs, international isolation, the lack of recognition and the ‘patron state’ factor as critical issues, and these lead him to notable insights. For example, although Turkish Cypriots were absent from official negotiations, they have still been affected by EU policies. Kyris draws our attention to how and by which agents Turkish Cypriot institutions have been affected; and in fact these are Turkey and the Republic of Cyprus itself. By looking at the changes that have impacted Turkish Cypriot institutions, Kyris rightly argues that these reflect ‘an institutional change and an “ideational” Europeanisation via the socialization of the Turkish Cypriots in the EU environment and the engagement with actors that share similar experiences of relations to the EU’ (101). It should be pointed out, however, that there is some inconsistency in relation to the writing of Turkish words. For example, some words follow the Turkish spelling, whilst in other parts of the book they do not (for example, Turk/Türk, Kurtuluş/Kurtulus); also, the Ulusal Birlik Partisi (the National Unity Party) is mistakenly rendered as the Usual Bilik Partisi (xii), and Makarios is wrongly referred to as Makarios II instead of Makarios III (31). These, however, are small issues that do not deter from the strength of the study. The Europeanisation of Contested Statehood: The EU in Northern Cyprus is a noteworthy and invaluable contribution in many regards. The gap it fills in relation to Turkish Cypriots is of immense importance, because it is one of the rare studies that takes up the Turkish Cypriots not just as an ‘insignificant’ group of people who ‘happened to live there’. Furthermore, it is the first coherent study that treats the impact and influence of the EU on northern Cyprus in a comparative manner, testing hypotheses and reaching interesting conclusions. 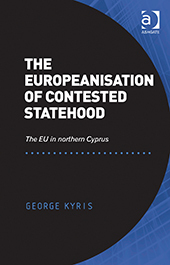 The discussion Kyris employs in the conclusion of the book regarding future prospects and EU contributions to contested statehood will surely be useful for researchers as well as specialists and non-specialists alike. Nikos Christofis is Assistant Professor at Fatih University, Istanbul. He received his PhD from the Institute for Area Studies (LIAS), Leiden University in 2015. His dissertation has the title From Socialism via Anti-Imperialism to Nationalism. EDA – TİP: Socialist Contest over Cyprus. Read more reviews by Nikos Christofis.